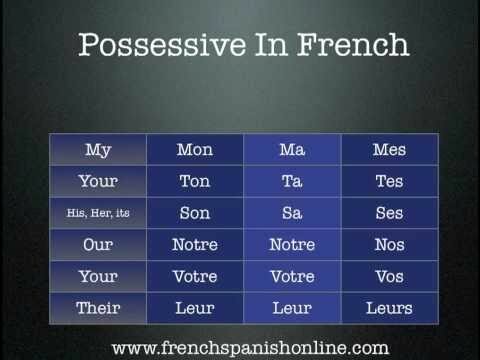 In French, the agreement of the possessive adjectives (my, your, his, her) doesn't work the same way as in English. Indeed, in French, possessive adjectives agree with the possession, as well as with the owner. Louis a emprunté mon stylo. Louis a emprunté mes chaussures. Louis a emprunté ma voiture. In English, we will use my because the owner here is me, (first person). In French, we will also use the first person, but it only determines the first part of the adjective, so it could still be mon, ma or mes. - In the first case, stylo is masculine, therefore we will use mon. - In the second case, chaussures is plural, therefore we will use mes. - In the last case, voiture is feminine, therefore we will use ma. In English, we will use your because the owner here is you, (second person). In French, we will also use the second person, but it only determines the first part of the adjective, so it could still be ton, ta or tes. - In the first case, chapeau is masculine, therefore we will use ton. - In the second case, collants is plural, therefore we will use tes. - In the last case, robe is feminine, therefore we will use ta. In English, we will use his or her because Annie, the owner here, is a third person (not I nor you), and it will be the feminine her because Annie (the 'owner') is a woman. In French, we will also use the third person, but it only determines the first part of the adjective, so it could be son, sa or ses. - In the first case, père is masculine, therefore we will use son. - In the second case, livres is plural, therefore we will use ses. - In the last case, mère is feminine, therefore we will use sa. Note that because of this, you cannot infer the gender of an owner based of the possessive adjective in French. In both cases, you will use sa because of la copine! Je m'appelle Sophie. J'adore mon chien. My name is Sophie. I love my dog. Inès is bringing back your clothes. Note that the plural persons notre/nos, votre/vos and leur/leurs (our, your, their) are simpler as they only agree in number with the possession(s). Elle a déjà son balai de sorcière. She has her witch's broom already! ...avec sa canne dans la main. ... with his cane in his hand. For "our parents" (ie. it is my brother and my parents), why do we say "nos parents" instead of "notre parents" since it is the same parents? Notre is singular, while nos is plural. Since you're referring to both parents, which is plural, then you'd use nos. It makes no difference whether the parents are the same or not. What is your specific question regarding the above? would you use pronouns ending in 'n' (mon, ton, son) for nouns that begin with vowel or silent h? In doing a recent quiz for the noun 'petite amie' a 'sa' was used... should son have been used instead? "Sa petite amie"(his girlfriend) is correct and the possessive adjective agrees with the possessed (petite amie) not the possessor (the person whose girlfriend it is) . Son amie but sa petite amie. Even though amie is feminine, you use son because it starts with a vowel. With petite there's no need for this anymore because it starts with a consonant. so in the case of amie, you would not need the 'n' as the adjective does not begin with a vowel. the pronoun changes as a result of the word following it and not the noun? In the context of this specific question, you were given the hint: "Use the 'tu' form", which meant only "tes yeux" was correct there. In some other lesson I read that we use ´son' for amie. This is probably to ease pronunciation. My question is what is the rule if there is an adjective between son and amie that doesn't begin with a vowel. Is son petit ´amie' or ' sa petite ami' correct? Bonjour Meghna ! The ending of the possessive adjective is determined by the word directly following it, therefore you will say "ma petite amie" :) I've now added a note about this case to the relevant lesson. I hope that's helpful! Bonne Année !